Intent-based networking is the difference between a network that needs continuous attention and one that simply understands what your organization needs and makes it happen. It’s the difference between doing thousands of tasks manually and having an automated system that helps you focus on business goals. 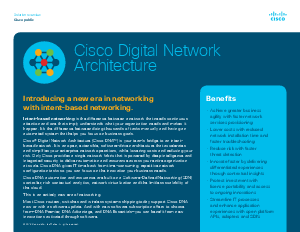 Cisco® Digital Network Architecture (Cisco DNA™) is your team’s bridge to an intentbased network. It is an open, extensible, software-driven architecture that accelerates and simplifies your enterprise network operations, while lowering costs and reducing your risk. Only Cisco provides a single network fabric that is powered by deep intelligence and integrated security to deliver automation and assurance across your entire organization at scale. Cisco DNA gives IT time back from time-consuming, repetitive network configuration tasks so you can focus on the innovation your business needs. Cisco DNA automation and assurance are built on a Software-Defined Networking (SDN) controller, rich contextual analytics, network virtualization and the limitless scalability of the cloud. This is an entirely new era of networking.